All digital oscilloscopes measure by sampling the analog input signals and digitizing the values. 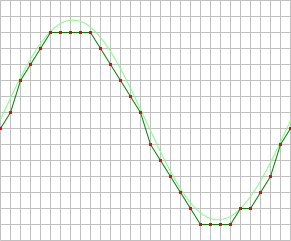 When an oscilloscope samples an input signal, samples are taken at fixed intervals. 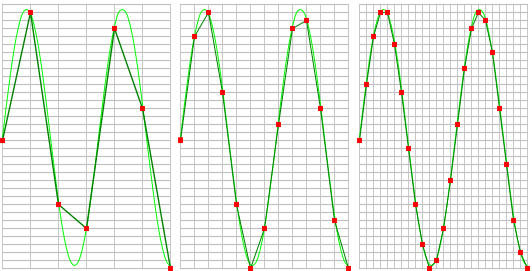 At these intervals, the size of the input signal is converted to a number. The accuracy of this number depends on the resolution of the oscilloscope. The higher the resolution, the smaller the voltage steps in which the input range of the instrument is divided. The acquired numbers can be used for various purposes, e.g. to create a graph. 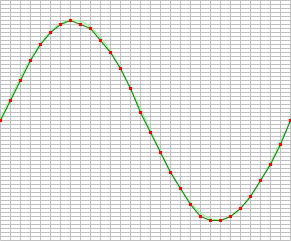 The sine wave in the above picture is sampled at the dot positions. By connecting the adjacent samples, the original signal can be reconstructed from the samples. You can see the result in the next illustration. As stated before, when sampling a signal, only frequencies lower than half the sampling frequency can be reconstructed. In this case the sampling frequency is 1000 Hz, so we can we only observe signals with a frequency ranging from 0 to 500 Hz. This means that from the resulting frequencies in the table, we can only see the 250 Hz signal in the sampled data. This signal is called an alias of the original signal. 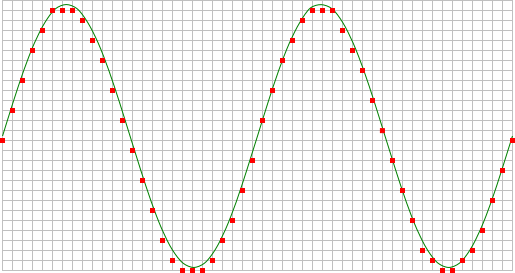 If the sampling frequency is lower than 2 times the frequency of the input signal, aliasing will occur. The following illustration shows what happens. 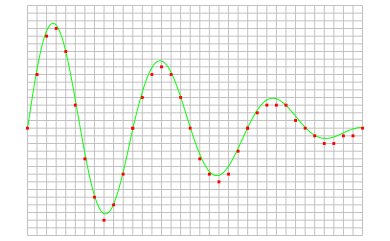 In this picture, the green input signal (top) is a triangular signal with a frequency of 1.25 kHz. 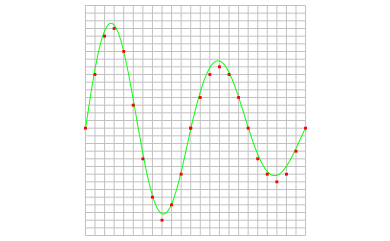 The signal is sampled with a frequency of 1 kHz. The corresponding sampling interval is 1/( 1000 Hz ) = 1 ms. The positions at which the signal is sampled are depicted with the blue dots. The red dotted signal (bottom) is the result of the reconstruction. The period time of this triangular signal appears to be 4 ms, which corresponds to an apparent frequency (alias) of 250 Hz (1.25 kHz - 1 kHz). 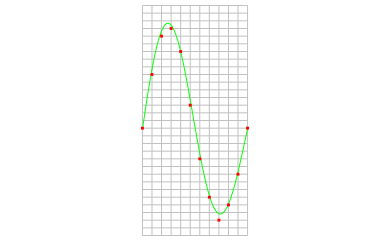 In practice, to avoid aliasing, always start measuring at the highest sampling frequency and lower the sampling frequency if required. Use function keys F3 (lower) and F4 (higher) to change the sampling frequency in a quick and easy way. The next illustration gives an example of what aliasing can look like. 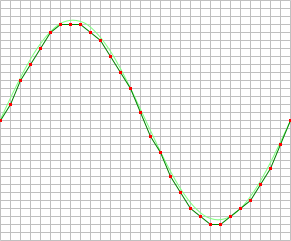 In this picture, a sine wave signal with a frequency of 257 kHz is sampled at a frequency of 50 kHz. The minimum sampling frequency for correct reconstruction is 514 kHz. For proper analysis, the sampling frequency should have been approximately 5 MHz. With a given sampling frequency, the number of samples that is taken determines the duration of the measurement. This number of samples is called record length. Increasing the record length, will increase the total measuring time. The result is that more of the measured signal is visible. In the images below, three measurements are displayed, one with a record length of 12 samples, one with 24 samples and one with 36 samples. Clicking the Record length indicator on the instrument toolbar and selecting the required value from the popup menu. Clicking the decrease/increase record length buttons and on the instrument toolbar. Using hotkeys F11 (shorter) and F12 (longer). Clicking the Record length label in the combined Record length + Sample frequency + Resolution indicator on the instrument toolbar and selecting the required value from the popup menu. Right-clicking the horizontal scrollbar under the graph displaying signals from the instrument and selecting Record length and then the appropriate value in the popup menu. Right-clicking the instrument in the Object Tree, selecting Record length and then the appropriate value in the popup menu. Information: Depending on the instrument settings, the instrument can have certain limitations with respect to the available record lengths. When a user defined value is requested that is not available, the software will use the closest available value. 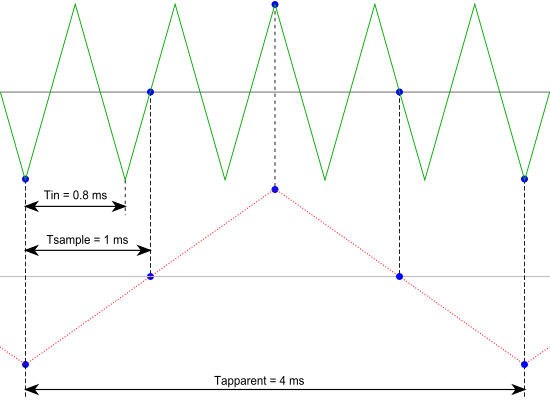 The combination of sampling frequency and record length forms the time base of an oscilloscope. To setup the time base properly, the total measurement duration and the required time resolution have to be taken in account. Clicking the decrease/increase Time/div buttons and on the instrument toolbar. Clicking the Time/div indicator on the instrument toolbar and selecting the required time/div value from the popup menu. Because a certain time/div setting can be created from different combinations of record length and sampling frequency, the Multi Channel oscilloscope software must decide which combination is used. The software will try to use the highest sample frequency possible and will adjust the record length accordingly to obtain the required time/div setting. To avoid the record length becoming this long that collecting the measured values takes longer resulting in the scope responding slower, the record length for time/div settings is limited to a value that can be set in the program settings. When the time/div setting is adjusted by one of the corresponding controls, the maximum record length is limited to this value. This limit does not apply to manually adjusting the record length.